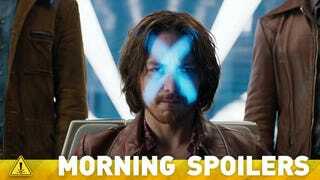 How Big A Part Will Wolverine Play in X-Men: Apocalypse? Mark Hamill talks about coming back to Star Wars, Christoph Waltz denies being the head of SPECTRE, and Cobie Smulders explains what Maria Hill's up to in Avengers: Age of Ultron. The Flash casts Cisco's brother and adds another villain to its list. Plus a ton of details about Batman v. Superman's attempt to address Man of Steel's main issue. Spoilers now! I have been speaking with the guys and I am not at liberty to tell exactly what's going on. Which is largely framing my answer here. But there's still a lot unknown, actually, about that. What I do know is there are some very exciting things about integrating the whole X-Men world, including the Wolverine movie. There's some really cool things going on. "It's kind of like Scrooge on Christmas morning. 'Oh my God, this time I'm going to appreciate it in a way I wasn't able to as a young man,'" Hamill says. "The fact that it is so special to so many people … it's hard to believe you could take something for granted like that." He pauses, and corrects himself. "That's probably not the best way to express what it was," he says of the first three movies. "We knew it was special, but [returning for the new trilogy] reminded me of taking out a pair of trousers from the back of the closet and discovering a $20 bill in the pocket." Christoph Waltz is saying that, contrary to popular rumor, he is not playing the head of SPECTRE. He told Collider, ""No. No. It's more interesting than that." Badass Digest has some information based on what they say is the version of the script that existed right before production began. They say that the film opens with a compressed version of the origin of Batman, fast-forwarding to him arriving in Metropolis during the events of Man of Steel. Since then, Superman has been establishing himself as a hero and Clark Kent is maybe-unhappy at The Daily Planet, and Clark is assigned to cover that Gotham/Metropolis football game that was one of the first things filmed for the movie. Very early in the film Lois is in the Middle East following a story when Superman shows up to help her out. This becomes something of an international incident as other nations view Superman as a tool of the United States. China, for instance, doesn't want him in their air space. It's an interesting look at how a being like Superman would be viewed on a global scale. As for being a protector of the people - when the Doomsday fight starts General Swanwick tells the military that Superman will move the battle away from populated areas because he's a hero, and that's what heroes do. Again, this is a direct response to complaints about the first film. It's also interesting to see that Swanwick, who was tracking Superman with drones at the end of Man of Steel, is such a supporter in this film. It seems that most people - except Lex Luthor and a cautious Batman, who is prepping anti-Superman weapons - believe Superman is a hero. There's so many pieces to this giant puzzle, and I'm happy that Maria Hill is one of them. She's working for Tony Stark, yes, but they shot so many locations all over the world and this team is out doing all sorts of things. So I like to think that Maria is at headquarters, trying to keep everything running as smoothly as possible. And working for Tony Stark is a whole other ballgame. She doesn't have S.H.I.E.L.D. personnel to back her up at her disposal, so it's an entirely different vibe for her. I really am [glad to have more input]. My position on it has always been, for over 25 years now, I would rather see no Sandman movie than a bad Sandman movie... People say, 'It's a crime there's never been a Sandman movie', and a couple of times, to be honest, I have thrown my body in front of a bus on a couple of bad ones over the years. I'm just happy that no bad Sandman movie has ever been made. But I'm really hoping that a good one will be. They're a good team. And with Joseph Gordon-Levitt in charge, his instincts are good and he loves the material. He wants it to be true to the material. ... Every now and then, I'll come in and last time I was in was earlier this year spending a day in a hotel room with Joe, and going over everything and answering questions with him and so on and so forth. So they've written a script. I got a phone call about two, three weeks ago from Joe and David saying, 'Jack [Thorne] did a script, we read it, we want some things done to it. We want you to see it, but not this version. The next version will be in three weeks and then you'll be the first person to see it.' So I am now a week before seeing the script. It's going to come in just before Christmas. I'm nervous, I'm on tenterhooks. But do I have good feelings? Yeah I do. I'm not entirely sure that [I'll be back] just yet, but there are talks. Basically they want to reboot the whole franchise, I think, and do something with me and the relationship with my son. I'm of course Davey Jones now, so I'm down the bottom of the ocean. It might be kind of fun to do something where I'm rumbling round the bottom of the ocean, because I won't look anything like me. [Gestures to face] Get all gnarly. Dante is a gifted pianist, but he never reached his potential and secretly resents Cisco's success. When the brothers are thrust into extreme circumstances, Dante must rely on Cisco if they're going to survive. When I first wrote Clara, I thought, "Oh, this is fun. If the Doctor were a young woman living in contemporary Britain, it'd be a bit like her." Clever and presentable and funny but also thinking when is something interesting going to happen? The interesting thing between the Doctor and Clara is she can sort of play the same game he does. She can absolutely do that, she's terribly clever, she's got a wayward ego. Her botched love affair with Danny is heartbreakingly proof of that. He's a lovely man with a traumatic secret, and she just screws it up because she doesn't really give it enough attention. It's just a little bit less exciting than running off in the blue box. You have to be a bit of a loony to think that way. I think for the first time, the Doctor's traveling with someone who's a bit of a loony like him, and that's quite fun. It wasn't so much the sadness, it's that both the Doctor and Clara are people who think they know better. That's what they are. The Doctor always thinks he knows better; Clara always thinks she knows better. So what they do at the end is a perfect summation of their relationship. They lie and endure pain and loneliness in order to protect the other because they think they know better. Amy would never have done that; she'd have told him what happened. But, people who are more controlling than that think they know what's good for everybody else aren't like that. So, Clara's not the Doctor; she's not the same person as the Doctor, but – the traditional thing is to say the hero and the archenemy are mirrors of each other. Are they? Are they though? Not really. I think it's more likely that friends are mirrors of each other. If you watch any close friendship, the extent to which they start to duplicate each other is quite interesting, even with Dr. Watson and Sherlock Holmes. While they're different people, they have similar appetites. So, yeah, it was the perfect way to say goodbye in that episode; each one doesn't think the other can cope with the truth. Six weeks following Moloch's defeat, Crane remains skeptical that their supernatural foes have indeed all been conquered, while Abbie takes solace in the fact no new enemies have yet revealed themselves. Despite this, Ichabod seems focused on recent reports which indicate there is something foul still afoot in Sleepy Hollow. Upon further investigation, the Two Witnesses discover a new, dark undertaking that is underway on the outskirts of town. In the wake of the events that transpired the night of Moloch's death, the relationship between Ichabod and Katrina has grown increasingly strained. Adding to the stress between husband and wife is the fact that their son, Henry Parish, has not been seen since. Further consternation arises from the fact that during their separation, Katrina has been spending an increasing amount of time in Abraham's company and, unbeknownst to her husband, is working to reverse the spell that has bound Abraham to the avatar of Death in a bid to restore his humanity. Meanwhile, Crane and Mills meet a new and unique ally named Orion, who brings news of a residual effect of the Lord of Purgatory's defeat. At first pleased by his arrival, the pair discovers Orion – and his true motivations – may not be as benevolent as first assumed.